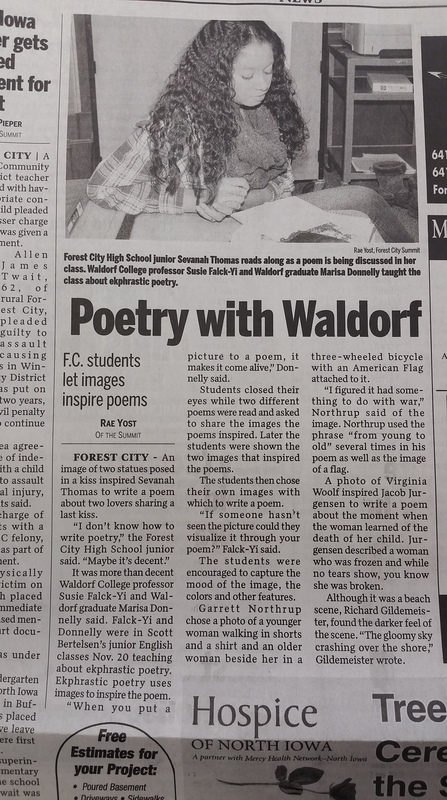 For the past two years, I’ve been a part of a group of students and faculty from Waldorf that spends a day at Forest City High School teaching students about poetry! This is something that the college has planned with one of the English teachers at FCHS, Scott Bertelsen, and it has been a great success! The lessons have centered on ekphrastic poetry, which is poetry inspired by image. For my lesson, me and one of my English professors, Dr. Suzanne Falck-Yi, taught together. We introduced ourselves and then made the students close their eyes while we read two poems. One was a poem inspired by Van Gogh’s Starry Night, the other was inspired by a terrifying Vietnam War image. As we read the poems, the students were to close their eyes and listen to the words. When we finished we debriefed and talked–What images resonated with you? What images and words stuck with you? Then we showed them the pictures to show the correlation between the poems and the pictures that inspired them. The bulk of the lesson, then, became practice. We set out thirty or so images: newspaper images, paintings, photographs, sketches, and random art. We told the students to just grab something that stuck out to them or something they noticed right away. Then they were to use the image to guide their draft of a poem. The focus was on using the picture to create description and detail–letting the image direct the words. It was meant to be a rough draft. It was meant to be challenging. But for the most part, the students took off. One student, as mentioned in The Summit, (left) really created a beautiful poem draft inspired by two figures kissing. After drafting for about 10-15 minutes, the students shared with peers and a few shared with the class. Our goal? 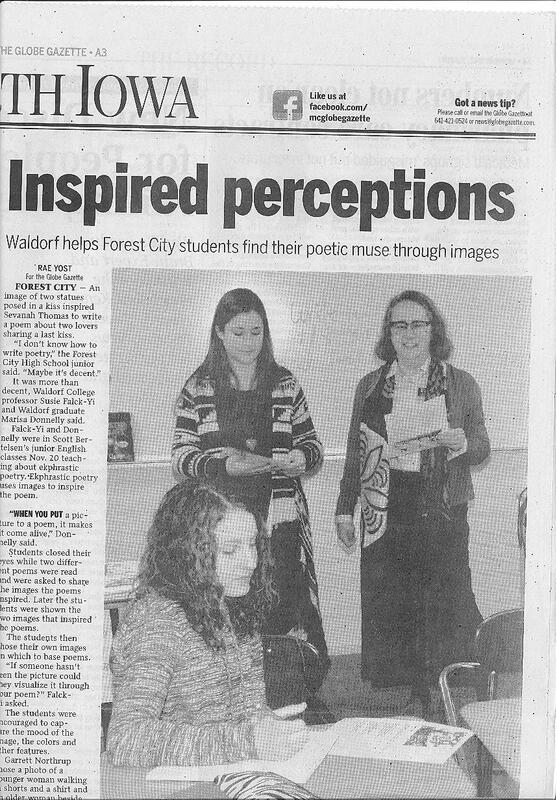 To make poetry accessible and to inspire creativity. If the students took one thing away, it would be that poetry isn’t too bad, especially when you use image as a guide. I love teaching this lesson, and after being in the middle school for so long, this was a refresher. I’m so thankful for the opportunity to be showcased in the Forest City Summit and for the opportunity itself–perks of being a prospective English teacher!